Commended for its innovative design and revolutionary office layout comprising seven vertical villages designed to foster organisational change, 8 Chifley sets the benchmark for future CBD office developments. Mirvac Development Director Simon Healy said 8 Chifley was a testament to Mirvac’s integrated delivery model, showing business agility and problem solving at its best. “Construction began without a major tenant pre-commitment presenting both a challenge and an opportunity,” said Mr Healy. When anchor tenant and law firm Corrs Chambers Westgarth signed an agreement to lease 10 floors of around 8100sqm Mirvac’s project team quickly mobilised a building design amendment to accommodate changes to suit the tenant’s requirements. Significant planning, procurement and design changes were required to meet the tenant’s brief for a workplace that would drive cultural change and these were achieved with no impact on the sustainability and functionality of the architectural concept nor to the delivery program. 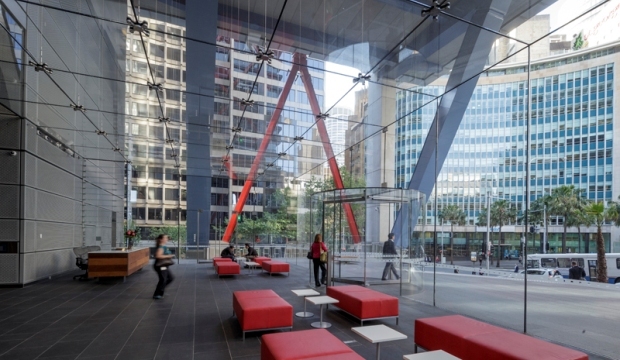 “Workplaces of the past tended to isolate staff from one another,” said Mr Healy, “however the vertical village open plan design of 8 Chifley breaks down these barriers connecting the floor plate vertically, allowing for a visual connection and promoting healthy interaction. The building’s distinctive red sway frames or “braces” support the lateral load of the building, preventing the core from twisting. This design feature in turn made it possible to devote 70 per cent of the 1580sqm site to the public domain with a plaza and cafe accessible to building users and the wider public. From a sustainability perspective 8 Chifley is one of only a few commercial buildings in Australia to achieve a 6 Star Greenstar design rating which entitles the classification rating of “World Leadership in environmentally sustainable design. The building has been fitted with a tri-generation plant which was upsized in order to export excess power produced to the grid and power other company assets. Also incorporated into the design is a black water treatment plant with sewer mining capabilities, reducing the use of potable water and minimising the output of waste into the sewer; naturally ventilated glass, fixed sun shading and 132 bicycle spaces and lockers. As a testament to the outstanding credentials of 8 Chifley, 98 per cent of the 21,700sqm FSA has been successfully leased to a range of blue chip tenants.